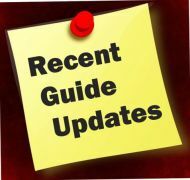 Below is a list of bullion glossary terms related to the bullion market. Included in the Glossary are Economic, Trading, Refining and Numismatic related terms. Click the terms without a definition for a more in-depth description. "Click" the Letter, to go directly to Definitions starting with it. Alloy - mixing two or more chemical elements, including at least one metal. (Ex: Gold is often mixed with a base metal or metals to add durability or influence the color. Ask Price - The lowest quoted price a bullion dealer or coin dealer will sell a item. Assay - the testing of a precious metal to determine its purity. Assayer - someone who tests precious metals to determine its purity. 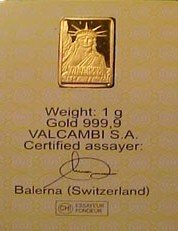 Assay Mark - the stamp from a assayer on a bullion bar of a precious metal to guarantee its purity. Backwardization - A market situation in which prices are progressively lower in future months than in the nearest month,caused by shortage or tightness in supply. Bank of England - Founded in 1694. has been the focal point of gold and silver trading in London for over three centuries. Bear Market - A market in which the trend is for prices to move lower. 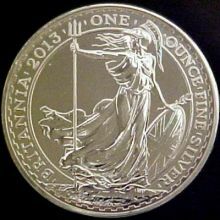 Brilliant Uncirculated Coin - A generic term applied to any coin that has not been in circulation. Broker - an agent between buyers and sellers between the buyers and sellers of securities or property. Bullion - Precious metals in the form of coins, bars, and or rounds in a investment trading form. 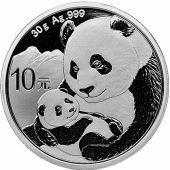 Consists of .999 purity or finer with little to no numismatic value over that of the metal content itself. Bullion Bank - is a members of the LBMA (London Bullion Market Association); they are investment banks that function as wholesale suppliers dealing in large quantities of gold. 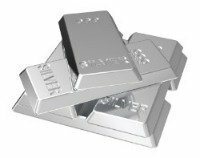 Bullion Bars / Ingots - Investment Bullion bars come in troy weight measurement. 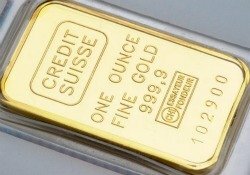 Private mints and refiners produce bullion bars. Bullion Coin - A precious metal coin, generally minted by governments. Bull Market - A market in which the trend is for prices to increase. 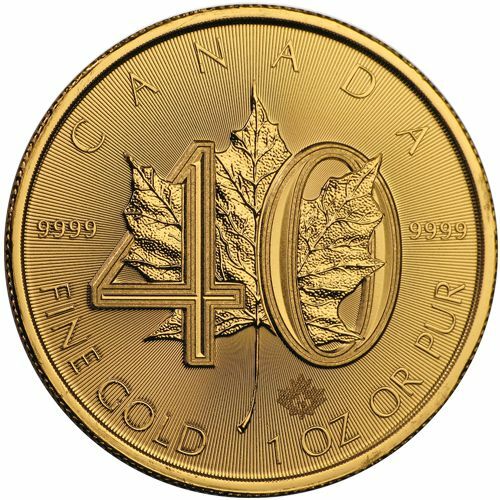 Bullion Rounds - Rounds that are similar to coins in shape, they are produced by private mints and refineries and have no status as legal tender. Rounds can be created to commemorate a person, place or an event. By-Product - A secondary mineral from a mine, refinery or a secondary refinery. Cast Bars - have a lower quality finish and are produced by pouring molten precious metal directly into a mold. 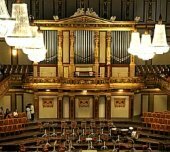 Central Bank - A central bank is also known as a reserve bank or monetary authority, is a government institution that usually issues the currency, regulates the money supply, and controls the interest rates of a country. Central banks also oversee the commercial banking system of their respective counties. 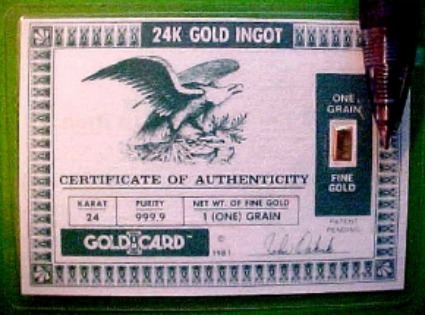 Chip-Gold - consists of a small ingot (1-20 grams) in a sealed and certified package the size of a credit card. Choice Uncirculated - coin grading term, An above average coin that may have a few light marks. CME Group Inc. - Chicago Mercantile Exchange - is the world's largest futures exchange company. Coin - is a term used for government issued legal tender coins. This is why the term "round" is used for privately produced coins. COMEX - is a division of the New York Mercantile Exchange (NYMEX), the worlds largest physical commodities futures exchange. Commodity - Raw materials that can be bought and sold, A transportable article of commerce, or trade. ex: gold, silver, corn, coffee, sugar or wheat. Cull - A coin that is worn to the point of being barely identifiable. Deflation - A phase of the business cycle during which consumer spending is seriously curtailed, bank loans contract and the amount of money in circulation is reduced. Doubled die - a term in used to refer to doubling in the design elements of a coin. Dow to Gold Ratio - is the amount of Gold Ounces it takes to buy one share of the Dow Jones Industrial Average. E Pluribus Unum - The Latin motto found on all U.S. coins, which means "Out of many, one". Executive Order 6102 - is an Executive Order signed on April 5, 1933, by U.S. President Franklin D. Roosevelt. 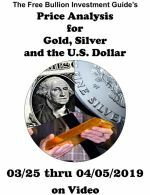 The Executive Order required all U.S. citizens to turn in all but a small amount of gold coins, gold bullion, or gold certificates owned by them, to the Federal Reserve. For every ounce of gold returned a citizen would receive $20.67. Executive order 11825 - is an Executive Order signed on December 31, 1974, by U.S. President Gerald Ford. It repealed President Franklin D. Roosevelts Executive Order 6102 forbidding U.S. citizens to own gold. 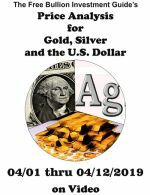 Shortly thereafter, in 1977, the U.S. Congress passed a law forbidding any president to confiscate gold from U.S. citizens, except during a time of war. Exchange - A meeting place for buyers and sellers of securities, or commodities. An unincorporated membership association the members of which trade securities or commodities, for themselves or others. Extruding Bullion Bars - Process in which a metal or other material is forced through a series of dies to create desired shape or shapes. Markings are usually stamped on the bar using a hammer or a press. Fiat money or Fiat Currency - is money that has value only because of government regulation or law. Today, all national currencies are fiat currencies, including the US dollar, the euro, and all other reserve currencies. Fineness - A measure of the purity; represents the purity of precious metals, either in monetary or bullion form. Fine Weight - The weight of a precious metal contained in a bullion bar, coin or round as determined by multiplying the gross weight by the fineness. Flan - A blank piece of metal in the size and shape of a coin; another term for a planchet or blank. Fundamentals - The study of basic underlying economic factors which apply to the state of business. 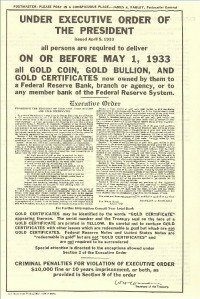 Gold Confiscation - also known as the executive order 6102 of 1933. It was an executive order signed by U.S. President Franklin D. Roosevelt forbidding every U.S. citizen to own gold. Gold/Silver Ratio - The amount of silver ounces it takes to buy one ounce of gold. Gold Standard - A monetary system with a fixed price for gold. 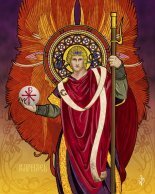 Furthermore, gold is either the whole circulation of currency within a nation or is supplied with notes representing and redeemable in gold. "Gresham's Law" - named after Sir Thomas Gresham (1519–1579). Gresham's Law is a monetary principle stating that "bad money drives out good." Money that has intrinsic value because it contains a precious metal will be over-valued and will leave the country or disappear from circulation due to hoarding. While money that has no intrinsic value and is made of base metals or easily manufactured commodities is undervalued and will flood into circulation. Hedging - A hedge is a position established in one market in an attempt to offset exposure to price changes or fluctuations in some opposite position with the goal of minimizing one's exposure to unwanted risk. Ex: If you were to buy bullion today, you would be hedging your money to any future losses in the dollar. IMF - The International Monetary Fund - was conceived at the Bretton Woods Conference in 1944 to promote international monetary co-operation and stability. Inflation - is the increase in the money supply, which causes goods and services to increase in price. Inflation is the inflating of the money supply or the excessive printing of money. 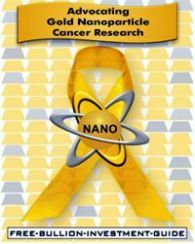 Intrinsic - the value of the actual precious metal in a numismatic item. Junk Coins - is a silver bullion market term used for any silver coin which has no numismatic or collectible value above the value of the silver it contains. Karat - The karat (symbol kt) a unit of measure of the amount of pure gold in a metal. One karat represents 1/24th of an alloy’s total weight. One hundred percent gold is 24 karats. Keynesian economics - also known as Keynesianism or Keynesian theory, named after Lord John Maynard Keynes (born June 5, 1883 & died April 21, 1946) he was a British economist whose practices and ideas have affected the theory and practice of modern economics. Keynesian economics argues that the private sector activities sometimes lead to inefficient macroeconomic outcomes and therefore advocates active policy responses by the public sector (government). This includes monetary policy actions by a central bank or reserve bank and fiscal policy actions by the government to stabilize output over the business cycle. Key Date - The rarest or one of the most rare and therefore most expensive members of a coin series. For example, 1916-D Mercury dime. LBMA - London Bullion Market Association, incorporated in 1987, to represent the interests of the participants in the wholesale bullion market. LPPM - London Platinum and Palladium Market. Margin - The amount of money and / or securities deposited by a client with a broker to finance part of the cost of purchasing. Margin Account - A brokerage account wherein listed securities may be purchased with the aid of credit provided by the buyer's broker. Margin Call - A demand made by a broker upon his/her client to advance money or securities either to finance an initial purchase or to maintain the minimum margin requirements set by the stock exchange or the brokerage firm or both. Market Instinct - The ability to interpret with reasonable accuracy, the true meaning and significance of price movements and volume changes and their relationship. Market Value - The actual monetary value which an bullion coin, round or bar possesses in itself. Milled Coinage - also known as machine-struck coinage is used to describe coins which are produced by some form of machine. Milled Edge - A raised rim around the outer surface of a coin. Mint - A manufacturing facility for producing coins. that have a specified dimension and weight. All the surfaces are smooth and even. Markings are usually stamped on the bar, using a minting press. Minter’s Die - A piece of very hard metal on which the design is engraved as hollows or reliefs, which will be reproduced on a blank in the minting process. Mint State - A grade of a business strike coin that has never been in circulation. It may have many marks, or none at all. 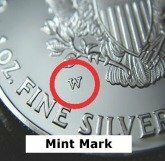 MS - Abbreviation for Mint State coin. Nixon Shock of 1971 - was a series of economic measures taken by U.S. President Richard Nixon in 1971 including unilaterally canceling the direct convertibility of the United States dollar to gold. Nugget - a small or large piece of a precious metal found in nature. Numismatics - The art and science relating to the study of coins, tokens, medals, paper money. Numismatist - One who is knowledgeable in the area of numismatics. Option - An agreement, which conveys the right to buy or sell a specific security, property or commodity at a specific price within a stated period of time. Over-strike - An impression made with different dies on a previously struck coin. Pegged Price - The price at which any commodity has been fixed (pegged) by agreement, custom or law. Perfect Uncirculated - coin grading term, bullion coins with a grade of MS-70 are in Perfect condition. 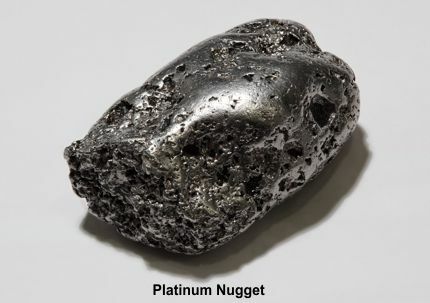 Platinum Group Elements / Metals (PGE/PGM) - six metallic elements consisting of platinum, palladium, rhodium, ruthenium, iridium and osmium. Precious Metals - are rare, natural metallic chemical element of high economic value. Precious metals have been used as currency, but are now regarded mainly as investment and industrial commodities. Gold, silver, platinum, and palladium are each recognized to be in this category. 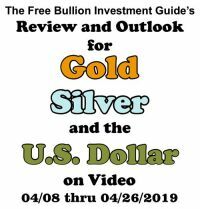 Premium (Bullion Coins, Bars & Rounds) – The added market value of a bullion coin, round or bar that exceeds the item precious metal spot price. The premium includes the costs of production, and dealer fees. 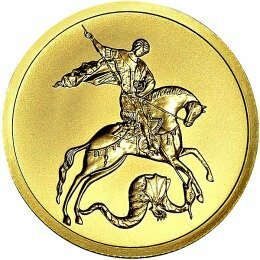 Premium (Numismatic/Collector Coins) - Collector or Rare coins usually carry higher premiums representing the coin's numismatic value. A Collector's Premium is based on supply or scarcity (mintage), demand from other Collectors for the coin, quality of the coin, and other intangible factors. 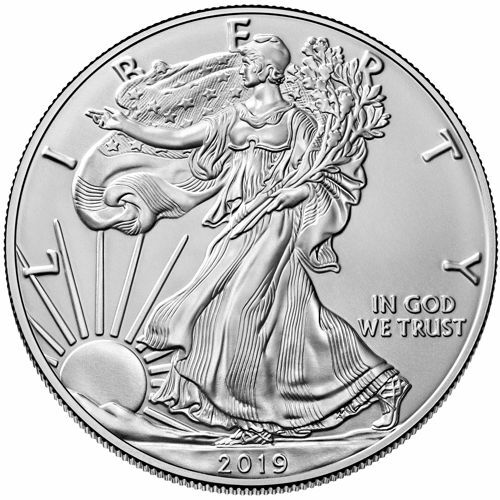 Proof Coin - is a coin made with a specially polished acid treated die, the background design of the coin die is polished, resulting in a mirror-like finish on the coin it strikes and a frosted finish on the raised portions of a coin. Quartation - The process in which silver is separated from gold by dissolving it out with nitric acid, commonly known as, nitric acid parting. Rarity - Generally relates to the scarcity or relative unavailability of a coin. Ratio - The relationship between one number to another, obtained by dividing the first by the second. Reeded Edge - The edge of a coin with grooved lines that run vertically around its perimeter. Relief - The portion of a coin design that is raised above its surface. Reverse - The back or tails side of a coin. Round - A round is a precious metal disk issued by a private entity and is not intended for circulation. A round does not have legal tender status and is not backed by a government. Roth IRA - Named after its chief legislative sponsor, the late Senator William Roth of Delaware. The Roth IRA is a special type of retirement plan under US law that is generally not taxed. The main difference from a Roth IRA and most other IRA plans is that once the participant retires they are not taxed on the money withdrawn from the plan. Sheldon Scale - is the grading system used for coins, named after William Sheldon who standardized coin grading in 1948. 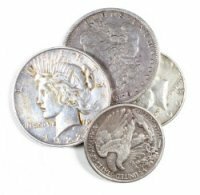 The Sheldon scale helps dealers, collectors and investors determine a coins' value. 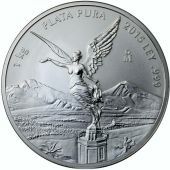 See the Graded Bullion page for more information. Short Sale - any transaction which creates a debt in terms of promised goods. Example in stock terms: selling a number of shares to make delivery to the purchaser, in hopes of buying back the stock for a return to the lender at a lower price. Silver Certificate - Paper money that was once redeemable for its face value in silver. Slab - a sealed hard plastic holder used by third party professional grading services to house coins they have determined to be authentic. 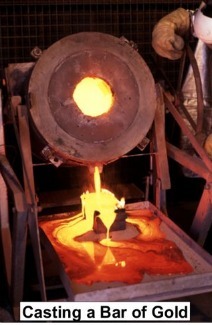 Smelting - a process of melting ores or concentrates to separate out precious metals from any impurities. Spot price - or spot rate of a commodity, is the price that is quoted for immediate delivery for cash. Spread – The difference between the buy price and the sell price. Tael - Traditional Chinese unit of weight for gold. 1 tael = 1.20337 troy ounces = 37.4290 grams. The nominal fineness of a Hong Kong tael bar is 990 but in Taiwan 5 and 10 tael bars can be 999.9 fine. Troy Ounce - (ozt.) - a measurement system of weight, used for precious metals, gemstones and gunpowder. Uncirculated Coin - a coin that was not issued for circulation. US Dollar Index - (USDX) - is an index to measure of the value of the United States dollar relative to a basket of foreign currencies. Swiss franc (CHF) 3.6% weight. Japanese Yen (JPY) 13.6% weight. Ware-House Receipt - a depository receipt issued when delivery is taken on a futures exchange. The receipt specifies the quantity and fineness of gold or silver sold. 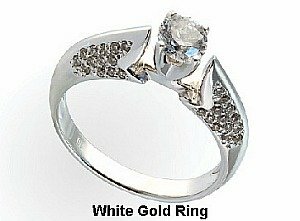 White Gold - most often used in the jewelery industry, it is a alloy containing a agent to whiten the gold such as silver, platinum, palladium or nickel. Yield Curve - The relationship between interest rate yields and maturity lengths. The curve shows the relation between the (level of) interest rate (or cost of borrowing) and the time to maturity, known as the "term", of the debt for a given borrower in a given currency. Investors expect a higher return for holding an asset for a longer time, hence yields normally increase with maturity length.